You’ve thought of ABC Seamless as the siding and gutter company for so long, and we’d like to show you that we’re so much more. Consider us your home exterior design experts. This handsome home in Duluth, MN has been transformed by applying our steel roofing panels to the top portion (gable walls) and seamless siding to the bottom. 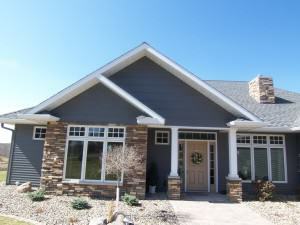 This project also features our 6” Designer Gutter system with Double-Flow™ Downspouts. By matching the fascia, gutter, and soffits and contrasting it with williamsburg grey steel shakes and siding, the warmth of the brick face is featured nicely. If it is time to redesign the look of your home, consider mixing materials on your project. Our Color Tool will let you experiment with new color combinations and many local ABC Seamless franchise offices offer our unique Home Design Service.